Our final stop includes the oldest dwelling in Glebe and some of the last built on its estate. No 21, Ritalynd (1899) has a fence which has been cast, but in an unusual pattern which suggests wrought iron. 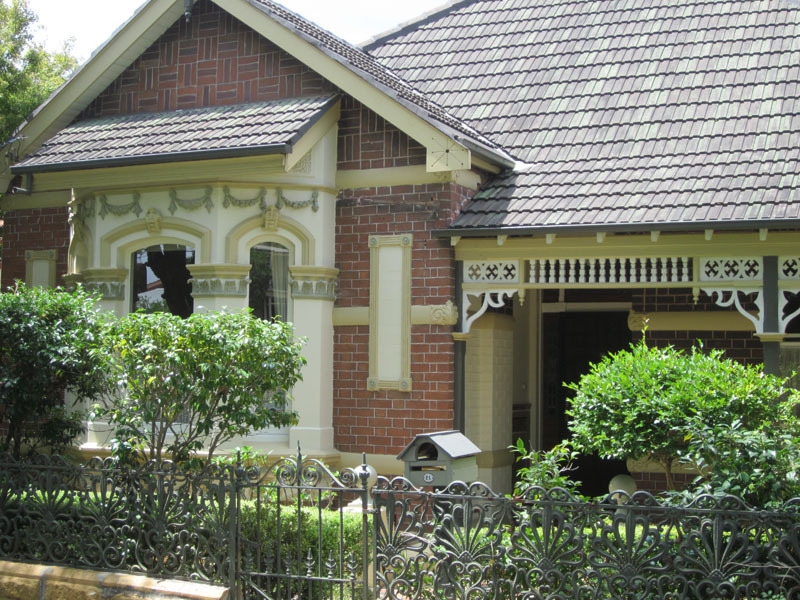 There are painted glazed tiles in the door recess and on the front wall, and a wooden fretwork frieze on the verandah. In the gable above the bay, tuck-pointing has been used to emphasize an unusual brick pattern. No 19,Llandillo (1898), is symmetrical and more Italianate, with double bays and peeping gables above the verandah roof. Both houses have similar wooden verandah columns. The mansion opposite and set well back is Toxteth Park, built by John Verge for George Allen from 1829-31. After his father’s death in 1877, his eldest son, George Wigram Allen, added a third storey and central tower, but much of the original building survives. The Allen family were very influential in the colony both socially and politically. They were strong Methodists and teetotallers, and when their estate was finally sold covenants prevented any commercial development, including, of course, pubs. Toxteth Park was sold to the Sisters of the Good Samaritan in 1900, who founded the current school, St Scholastica’s, and built the Romanesque style chapel during the Great Depression. The chapel has good acoustics and is frequently used for concerts. If it is open it is certainly worth a visit. Toxteth Park is now a convent and is only open on special occasions. 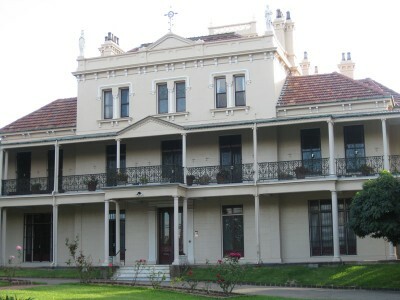 The stone gates at the corner were brought from their original Pitt Street convent by the Sisters. This is the end of the walk, but by no means the end of the streetscape. Continue along Avenue Road as it curves left to join Toxteth Road, and turn left to reach Glebe Point Road, transport and refreshments. Bernard and Kate Smith, The Architectural Character of Glebe, University Co-operative Bookshop, Sydney (1973), pp15-17.